I, like millions of other people, have been obsessively following the goings-on of the 2016 Rio Olympics. Every few years, a mini-Hollywood for the athletically-talented springs up somewhere cool, and for two weeks, we peasants get to watch their feats of strength and grace, all while looking down at ourselves and murmuring "there's no way I could do that!" My Olympics fandom is, unfortunately, marred by a nagging thought, present through all the coverage I watch: none of these people have bodies that even remotely resemble the wide-hipped, soft tummied flesh vessel I call home. At least, not until recently. That's why Sarah Robles' weightlifting win is a big deal for big girls like me: we finally have an Olympic medalist whose body looks more like our own. Between Robles and American shot put gold medalist Michelle Carter, the 2016 Olympics have offered two incredible role models for body diversity in a worldwide-televised event that typically showcases the built and svelte, but not the curvy. To have two larger women win Olympic medals for their strength, athleticism and skill doesn't just offer visual representation for plus size women: it diverges from dominant roles for fat women in media, which typically casts big women as the fat, funny sidekick or the "sassy black woman." Both of these tropes are offensive and show fat women as one-sided stereotypes rather than, you know, nuanced individuals with as many dreams and experiences as thinner people. Despite the significant fat-positive progress made in entertainment (and even in the health industry, which has long been considered at-odds with the fat positivity movement), it's telling that there are still so few plus-size role models in athletics, a field most consider to be in opposition to fat acceptance. The response to the concept of being plus size and healthy is so extreme that the supermodel Ashley Graham, who graced the cover of the Sports Illustrated's annual swimsuit edition earlier this year, was the subject of fat-phobic vitriol online at a mere size 16, only one dress size above the average American woman and what fat activists consider "small fat" or at the smaller (and more socially acceptable) end of the plus size spectrum. Seeing Carter and Robles in the news showing off not only their bodies but, more importantly, their strength, was something of a revelation for me — and I've been involved in fat and body positivity for eight years. 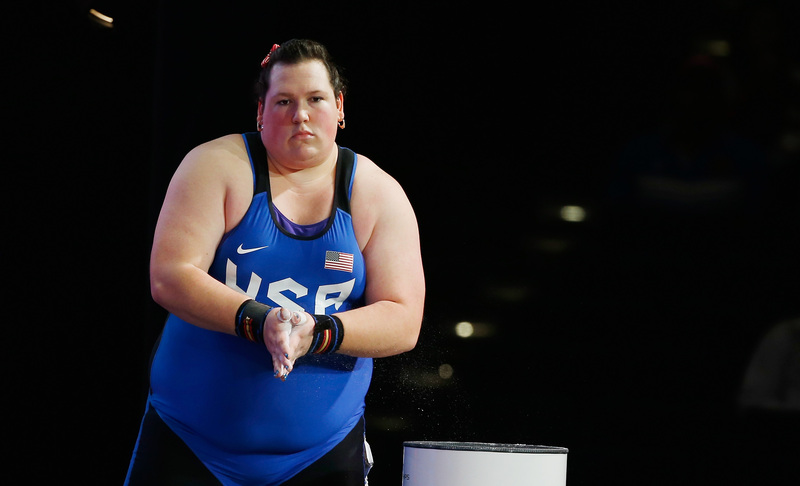 Our culture has reached a point where we can accept big women and people can be as beautiful and desirable and stylish (and smart, and healthy) as anyone else, but we're only now making inroads into the concept that fat people and fat women specifically can also be strong and athletic as well. There's a reason why people from marginalized, oppressed, and otherwise un-represented groups crave representation in society. Big girls like me grow up with so many implicit and explicit messages telling us our bodies are wrong, whether it's from the pages of the magazines we long to write for or the television shows and movies we aim to emulate. To see people that look like us, even if they're airbrushed (or elite athletes) begins to remove, in our minds, a barrier that seems insurmountable without those representations. Of course a few big female Olympians aren't going to suddenly make fatphobia and body shaming go away, but they add nuance to the body positive discussion that is increasingly co-opted to sell us crap we don't want, often while feeding us the same harmful lines of thought we were raised on. Seeing big women winning Olympic gold medals and being praised for their incredible athletic prowess in the world's most exclusive arena tells us that not only are we able to wear the clothes we want or date the people we want, but we're also worthy of praise and admiration because of what our bodies can do, and not in spite of them. The growing trend of diversity at the Olympics, be it racial or body type, shows that on at least one world stage, those of us who are marginalized needn't apologize for who we are.